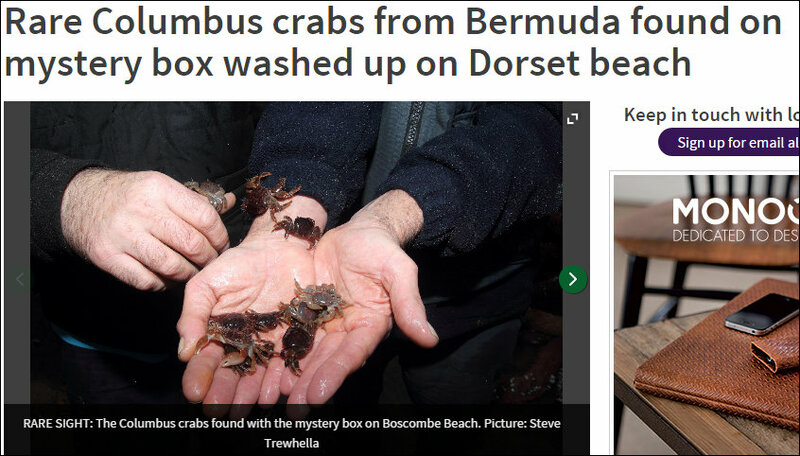 A number of rare Columbus crabs from the Bermuda area were recently found on box that washed up on Dorset beach in the United Kingdom after traveling almost 4,000 miles from their home in the Sargasso Sea, according to the Dorset Echo. A story in the Dorset Echo said, “More than 80 Columbus crabs, which are rarely seen in the UK, have washed up with the mystery box on a Dorset beach. “Marine conservationist and photographer Steve Trewhella said he found 83 of the creatures when he went to investigate the box. The crabs, which come from Bermuda, live on floating objects and have been carried by Atlantic currents and storms to the UK. “And while the box itself carried nothing of interest it appears to have travelled almost 4,000 miles before washing up on the Dorset coast. “These crabs live in the Sargasso sea in the Caribbean so this box must have at least travelled through there before finding its way to Boscombe,” said Steve, 51. “It’s amazing really to think that such a large number of them have travelled all that way and are still alive. “It is also the largest number of these crabs which have ever been found on one object in the UK – the most ever recorded until now was 17.